From bare walls to sophisticated stores, fully equipped and ready for business. On time, on budget, and exactly to your specifications. At Intelecom we understand the pressures, budget constraints and time sensitivity that surround a successful launch. The last thing your business needs is the headache of managing outside tech staff, service technicians, quote requests, site visits and approvals. 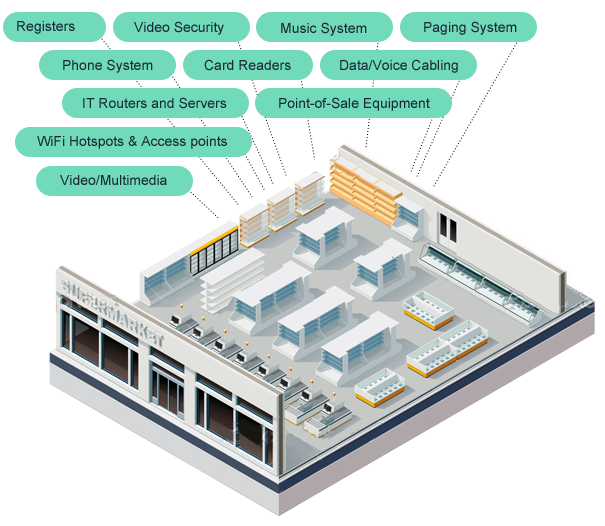 With our Retail Roll out Program, we take all of these aspects and neatly organize them under one point of contact, us. With that said, going forward, literally the only number you will need to have is ours. We will handle all the leg work and multi contractor management so that you and your team can focus on what you do best. We offer flat rate, per site or per device pricing for our rapid deployment of certified services. Benefit from our single point of contact business solution to help you avoid cost overruns and missed launch target dates. Our strict adherence to service and quality control assurance compliances have been put through rigorous hours of real life field case deployments.